I needed a place to put my lawn tractor and outdoor tools so I told my wife that I was going to build a shed. She said: “Fine.” Then I thought it would be pretty cool if the shed was built like a Hobbit house. When I told my wife I think she said: “You’re crazy.” Soon thereafter I began this project. Costigan spent four years building his Hobbit Shed, which he finished in 2011. Since that project was such a success, Costigan decided to use that template to build an actual livable hobbit home as well. Called “Hobbit Hollow,” the 1,500-square-foot eco-friendly house is built on a 1.7 acre lot in upstate New York. Working mostly on weekends, it took Costigan six years to finalize the project and he documented the entire process on his blog—which launched in December of 2012 and posted its final update on June 2018. Reading through the blog, it’s clear that this isn’t just a cheap pop culture stunt but a real passion project for Costigan, who clarifies that he’s more of a Silmarillion geek than a Lord Of The Rings geek. A lot of the posts open with updates on Costigan’s life, and construction was mainly handled by Costigan, his wife, their four teenage kids, and family friends. His Hobbit Hollow Instagram account is similarly a mix of construction insights and sweet family updates. But even though this was a family affair, Costigan definitely knows what he’s doing. He has a Bachelors of Civil Engineering degree from Villanova University and works in the reinforced concrete high-rise business in Manhattan. He built his concrete hobbit home to be virtually indestructible and incredibly ecofriendly. The hobbit house is an “earth-sheltered passive house,” which means it has minimal air leakage, high performance windows, minimal thermal bridging, and an energy efficient heat recovery ventilation system. That drastically minimizes the amount of energy needed to heat and cool the house. Hobbit Hollow also has a living green roof, which includes a 12x12 patio on top. 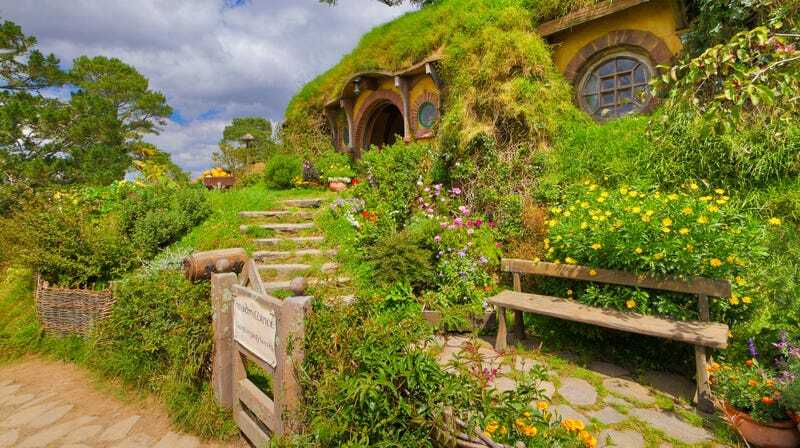 Rather than serving as an exact replica of Bilbo’s Bag End, Hobbit Hollow is Costigan’s contemporary riff on the hobbit aesthetic. After finally completing the project, Costigan decided to put the two bedroom, two bathroom house up for sale. It’s completely livable and looks pretty damn spacious, although the interiors (floors, counter tops, paint, fixtures, etc.) have been left for the eventual owner to finish. You can read more about the technical side of the project on The Journal Of Light Construction. The owners of the real-life Simpsons house are "vigilant about keeping the doors locked"